MTV caught up with Robert Kirkman to spill some details on the television adaption of his comic 'The Walking Dead' and it how it will differ from the comic. ROBERT KIRKMAN: When I heard that Darabont was interested in doing it a long, long time ago, I was just ecstatic. For me, "The Walking Dead" is not necessarily a horror thing. It's not all about the shocks. It's about characters and all of that dramatic nonsense. And Darabont does that better than anybody. If you've seen "The Shawshank Redemption" or "The Mist," you know he gets to the heart of the characters and shows them dealing with extremes. It's a match made in heaven. MTV: There were rumors that Guillermo Del Toro was initially interested in the project. Was that the case? Did you know about him being interested, too? MTV: How much will you be involved in shaping the series on AMC? KIRKMAN: I'm going to be an executive producer on the show, so I'll have my hands all over the thing. But it's important to me that I'm only involved in the show as much my comic book career will allow. I'm excited that there is a television show, and I'm excited that Darabont is involved—and one of the big reasons for that is that I trust him. I don't need to look over his shoulder. Frank understands the material 100 percent. It's always been shocking to me, doing Hollywood meetings over the years, just how easy it is for someone to come in to the meeting and say something like, "We want the zombies to have super powers." Knowing that, I'm really excited about it, because from my discussions with Frank, he likes the right things about "Walking Dead." MTV: How will the TV series relate to the comic? 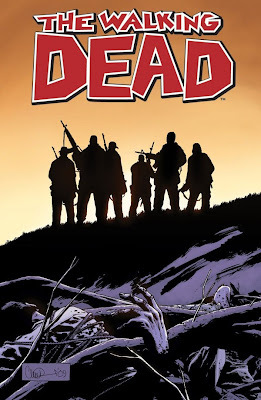 Will it follow the same basic story arc, or will it explore a new area of the "Walking Dead" universe? I think it will be 100-percent true to the tone of the series, but at the same time it will be an entertaining, secondary way of experiencing "The Walking Dead" in a completely different light, so I'm excited. MTV: There's been some concern that the series might lose its edge being broadcast on AMC instead of one of the less-restricted networks like HBO or Showtime. Is that something you're worried about? Is that even a concern? KIRKMAN: I had no concerns about that whatsoever, because one of the concerns I have about zombie fiction is when they rely too much on the shocking gore aspects. That's not really the point of "Walking Dead," so to a certain extant, I think it will work better at AMC—because it forces people not to rely on that stuff. As far as "Walking Dead" not having teeth on AMC, if you've ever seen [certain episodes of] "Mad Men" or "Breaking Bad," they push a lot of boundaries as far as content goes. In fact, I just had a meeting with a bunch of the executives at AMC, and Darabont, and Gale Anne Hurd and David Alpert at Circle of Confusion, and the executives were talking to Darabont about his script and they said, "You can't use the F-word." That was the only limitation they gave him. We were all stunned. The thing is, you don't necessarily have to see everything that's going on, and sometimes things are even more horrific when you don't see the goriest parts.